Ex-Arsenal winger Marc Overmars has signed a new contract that keeps him as Ajax's director of football until 2024. Overmars, 45, had been linked with a return to the Gunners in the position of technical director, but instead will remain with the Dutch side. "We are taking steps with both the youth academy and the first team and we still want to show a lot." Arsenal are looking to make an appointment after recruitment head Sven Mislintat left in February and were linked with Spaniard Monchi, who had left his role as director of football at Roma at the start of March. However, on Sunday it was announced that the 50-year-old Monchi will return to his former club Sevilla and become their sporting director. 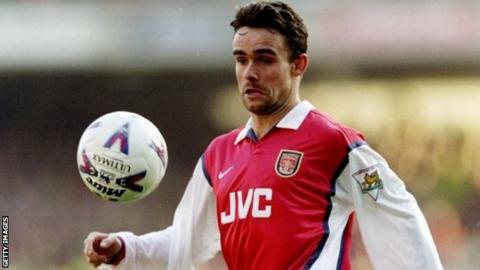 Overmars made 143 appearances for Arsenal in all competitions between 1997 and 2000, helping the club win the Premier League and FA Cup in 1998. He retired from playing in 2009 and has been part of Ajax's management since 2012. The club are second in the Eredivisie - five points behind PSV Eindhoven - and into the last eight of the Champions League after stunning 13-time champions Real Madrid 5-3 over two legs.